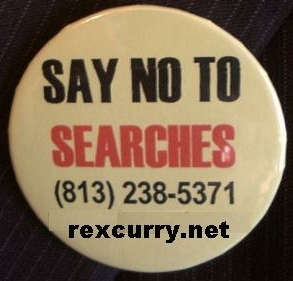 RexCurry.net was one of a handful of lawyers who protested against and tried to stop assembly-line searches and demands for identification and 'papers' at government buildings and elsewhere. Many courthouses force lawyers to submit to the degrading practices (along with everyone else) and most lawyers submitted without a peep of protest, and many lawyers openly defended the police-state tactics and they still do so to this very day. TEACH EVERYONE TO SAY NO TO SEARCHES - Rex teaches school with new lessons about liberty. THE SNTS SUPERHERO - you can be the "Say NO to Searches" superhero, with this free gear. 4th Am. UNREASONABLE SEARCHES - government schools enable illegal searches of students. 4th Am. 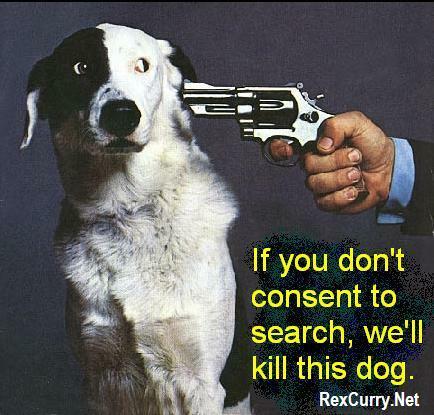 SEARCHES WITH DOGS - drug laws encourage the corrupt use of drug dogs in a police state. 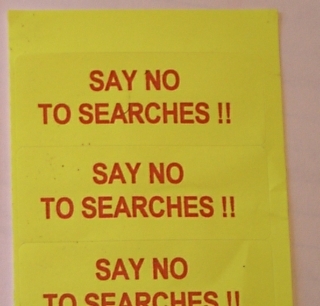 SAY "NO" TO SEARCHES (SNTS) - liberty lawyers fight government out of control. 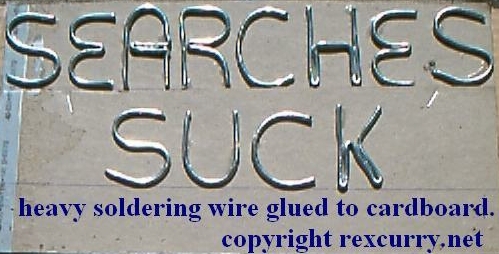 ASSEMBLY LINE SEARCHES - can police state tactics be refused? 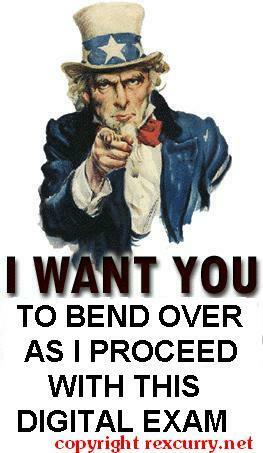 UNCLE SAM -wants you to bend over for his cold paranoid finger pic(1) pic(2). Tell him to bite the 4th Am. LAWYER SEEKS INFO ON SEARCH REFUSALS - describe any incidents and their outcome. OPPOSING DEMANDS FOR IDENTIFICATION - & police states and government paranoia. FREEBIES - hand out these stickers and badges at parades & events. It's my educational pro bono work. DRUG SNIFFING DOGS - he said "NO" to searches (SNTS). And he won! Bow-wow ! DRUGS, GUNS & BAD POLICE SEARCHES - another victory for liberty & peacful conduct. PEACEFUL COCAINE SALE WITH BAD PURSE SEARCH - lady is free to go. COPS: THEIR OWN ANONYMOUS TIP SOURCES? - not in this cocaine case. Here are cases that illustrate issues in consent searches of vehicle stopped as a result of traffic stops. Because consent searches of vehicles are so popular with police officers these days, these cases are important to understand. In Johnson v. S., ___ So. 2d ___, 33 F.L.W. D2515 (1st DCA 10/24/2008), an officer made a valid stop for a tag light violation. He asked the driver and the appellant, a passenger, for consent to search their persons, and both agreed. Before searching defendant, the defendant tried to get out of the car, and the officer directed him to remain inside. A subsequent search of the defendant revealed cocaine. The trial court denied a motion to suppress, and the First DCA reversed, finding that the officer's actions constituted an illegal seizure of the defendant. "Importantly, consent is fleeting. The only relevant time period to determine if an individual has given voluntary consent is at the time of the search. Once consent is given, it can be withdrawn at any time for any reason. It can be withdrawn by an individual's words (see Jackson v. State, 730 So. 2d 364, 365 (Fla. 4th DCA 1999) (stating "the individual may, at any time during the search, withdraw consent by words"), or by an individual's actions. See Lowery v. State, 894 So. 2d 1032, 1034 (Fla. 2d DCA 2005) (finding consent was withdrawn when the defendant attempted to reach into his pockets at the same time as the officer); Pierre v. State, 732 So. 2d 376, 378 (Fla. 2d DCA 1999) (finding consent was withdrawn when the defendant ran away from the officer). Likewise, it seems reasonable that consent can be rendered invalid, effectively withdrawn, by intervening unlawful police conduct. This would be especially true when the unlawful conduct involves a violation of the Fourth Amendment rights of an individual whose previously granted consent is all law enforcement has to justify a search. In such circumstances, it would be unreasonable to assume consent continues indefinitely, no matter what action law enforcement takes. Applying this principle here, the illegal detention of Appellant, after he had given consent but before the police exercised the privilege extended by the consent, created a taint which could be overcome only by a sufficient break in the chain of illegality. The burden to establish this break rests with law enforcement. There is no evidence that such a break occurred. Therefore, the search must be found nonconsensual, and the evidence improperly seized. The trial court erred in denying Appellant's motion to suppress." In S. v. Petion, ___ So. 2d ___, 33 F.L.W. D2505 (2d DCA 10/24/2008), an officer made a late-night stop of a car on the interstate for a window tint violation. The officer gave a warning, and then asked for and got consent to search. He quickly found a locked after-market compartment in the rear passenger area and asked whether defendant knew how to open it. He did not, and the officers then spent an hour opening the compartment, inside which they found cocaine. The trial court granted a motion to suppress, ruling that the destructive nature of the search went beyond defendant's consent, and that his non-verbal actions constituted a withdrawal of his consent. "Under the United States Supreme Court's holding in Jimeno, the deputies did not need to obtain additional or separate permission to continue the search into the locked, secret compartment. Jimeno, 500 U.S. at 251 ("[I]t was objectively reasonable for the police to conclude that the general consent to search respondent's car [for drugs] included consent to search containers within that car which might bear drugs."). Thus, from the viewpoint of the circuit court, the primary issue in this case was whether Mr. Petion withdrew his consent to search the secret compartment after it was discovered. As explained above, the circuit court determined that Mr. Petion revoked his consent when he refused to assist the deputies in gaining access to the compartment. The problem with this finding is that Mr. Petion did not testify at the suppression hearing, and the testimony from the two deputies established that Mr. Petion claimed that he did not own the car and knew nothing about the secret compartment or how to open it. He never asked them to stop the search, he shrugged when given the opportunity to object to the deputy's forcing open the compartment, and sat passively on the side of the road for the one-hour period while the deputies were trying to break into the compartment. "It is well settled that in the context of a consensual encounter, a voluntary consent to search can be withdrawn. .... It is equally well settled that the consent can be withdrawn either verbally or nonverbally. See E.B., 866 So. 2d at 203. It is not so well settled what type of nonverbal conduct revokes consent to search or who bears the burden of proof to establish that consent once given has been revoked. "Thus, we conclude that if a defendant raises the issue of withdrawal of consent by nonverbal communication, the State must prove by a preponderance of the evidence that the defendant did not engage in the type of nonverbal communication that an objectively reasonable officer would interpret as a withdrawal of consent. In this case, Mr. Petion's conduct can be fairly summarized as a passive failure to object. Reviewing this issue de novo and relying on the circuit court's historical findings, we conclude that he did not revoke or withdraw his consent by any nonverbal communication after the deputies found the secret compartment." & fight the USA's growing police state. Each student was given a sticker that reads “Say ‘NO’ to searches,” so that they could wear the stickers on their shirts. I explained that I often distribute the stickers to the public when I attend parades and public events. The stickers were printed from the computer onto sticker paper from the office supply store. Next, I told the youngsters that lawyers are like teachers because lawyers teach people about laws and about police officers. The U.S. Constitution gives everyone constitutional rights, including the right under the 4th Amendment against unreasonable searches. Under the U.S. Constitution, people can say "no" to police who ask for permission to search. In some countries, people cannot say “no” to searches and interrogations by police. And in our country we are continually losing our freedom also. Often, adults (especially adults who have been educated in government schools) do not know that they can say “no” to searches and interrogations by police officers. Often, adults who allow searches and interrogations cause their own arrests. It is my job as a lawyer/teacher to help my clients say "no" to searches. I explained to the class that in my law office I will pretend to be a police officer asking my client to consent to a search or questioning, in order to help train my client to say “no” and to ask for a lawyer. I asked the entire class to participate in a role-playing game, where I would pretend to be a police officer and the class would answer the way my client (named "Bob") would answer me in my office. “Let’s pretend I am a police officer who has come to Bob's home,” I said. “What does Bob say to me in response?” I asked the class. The government-school children screamed in unison “No!” (some children said "yes" but they quickly caught on). The government-school children screamed unison “NNoo! !” and pointed at their "say 'NO' to searches" stickers. That is how I teach adults to give similar responses. Things are different for children inside a government school, aren’t they? I encourage all libertarians to participate in the “Great American Teach-in,” especially in government schools.